Choosing the perfect cage for your pet hedgehog is one of the crucial decisions that you will be making because it’s no different than buying your own house. The hedgehog will be spending most of its time in there, and so you don’t want to make any mistakes. If you want a happier and healthier hedgehog, then make their cage as hospitable as possible because they need to explore and exercise. Hedgehogs are not big in size, but they are very active. They run around a lot and also love hiding. Also, they have tiny and delicate feet, and so you should be careful when buying them a cage to ensure that it has all the necessary features to meet their needs without hurting them. With their tiny feet, hedgehogs are better off running on a flat surface. Any wire or mesh-based surfaces will hurt them, hence limiting their activeness. It’s a fact that hedgehogs have poor eyesight, though a great sense of hearing and smell, and so you don’t want to make life harder for them by not providing a flat surface. Hedgehogs are tiny, but they need plenty of space to run around, play and hide. The minimum size for a hedgehog cage should be 2 ft. X 4 ft. There is no limit to how large it should be as long as you have enough space, and he/she will appreciate a large cage given their active nature. The size should be enough to allow free movement and also to hold a litter box, a wheel, eating area and a sleeping bag.Also, ensure that the cage is well ventilated. Apart from ensuring that the base surface is flat, ensure that the cage edges are well secured. There should be no sharp objects either, and all of the toys in the cage should be safe. Again, there shouldn’t be large spaces where their tiny heads can get stuck, or they end up escaping altogether. Also, the cage should be in a safe place, away from any predators. They are also little climbers. So, ensure that the cage’s interior is smooth. The temperatures must be right for a hedgehog to survive in a cage. They are best staying in temperatures between 70˚- 80˚, so avoid placing their cage near windows or a cold corner because the cold might affect their health. Just like any other pet, you will have to clean up after your hedgehog, including their cage. They play a lot, and you will find their pee and poop in every corner of the cage so ensuring that the cage you are about to buy will be easily accessible for cleaning is a bonus. When choosing hedgehog bedding or toys to put in the cage, avoid anything made of cedar because cedar has some aromatic oils that can lead to respiratory problems in your pet hedgehog. Wire cages are common, and they often have a deep pan and a solid bottom. One big advantage of going for this type is that they are well ventilated and if the temperatures are low, you can easily and safely heat them with any ceramic heat emitter. Again, wire cages have more floor space compared to other modified cages. Generally, wire cages are strong, and they can protect your hedgehog from small children and other pets. However, quality matters so you should do a background check on the different brands before purchasing one. Pan cages are either metallic or plastic, and both are usually lightweight, but most people prefer plastic pans because they do not rust and are also easy to clean. Also, metal isn’t the best option if you will be providing additional heat in the cage. To prevent your hedgehog from climbing if you want a pan cage, go for one that’s at least 6” deep. These are relatively cheap, lightweight and portable. They are also easy to clean and disinfect. However, finding a large enough plastic storage container to accommodate other accessories can be a challenge. Again, they inhibit easy viewing which is limiting for both the pet and the pet owner since hedgehogs too, just like most pets, need environmental stimulation. Lastly, these types of cages are dangerous when used with additional heat sources. If you have a large aquarium, you can use it to host your hedgehog. However, aquariums too might be limiting for a hedgehog because they lack enough floor space. They are also cumbersome, costly, heavy and also difficult to clean. This is definitely a great cage for a hedgehog. First, it is well ventilated as it features an upper wire frame and it is safe for hedgehog’s tiny feet thanks to the plastic bottom base. 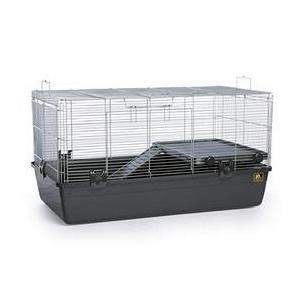 It’s an X-large cage measuring 49” x 22” x 24”, so the hedgehog will enjoy running around, climbing and hiding in it. You can also add toys and anything else in there without restricting his/her movements. Again, it’s super easy to clean and has a spacious balcony that’s designed to have an access ramp. And, included too is a tip-proof pet food dish on the balcony floor which is an added advantage since you will be cutting down on expenses and the fact that it’s tip-proof means less mess. The pan is 7.5 inches deep, which is enough to keep your hedgehog pet from climbing to the top wire frame. 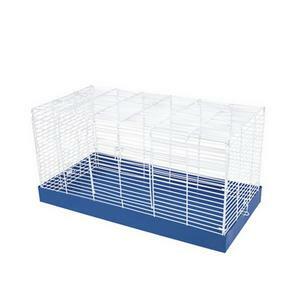 This cage measures 40.2” x 21.3” x 19.7” which is enough to accommodate your hedgehog pet comfortably. But, one thing that makes it stand out is its easy inside access design. It features two large openings, one at the top and another at the front, for convenient inside access. This makes it easy for you to clean it, feed your pet, or let him in and out. It also features a spacious balcony from where your pet hedgehog can look outside or hide in the underneath space when he needs to rest or just have some privacy. And, unlike the Living World Deluxe Habitat, the AmazonBasics Pet Habitat has an access ramp, thus allowing easy up and down. It also comes with a securely fitting non-tip food bowl, plus a hay guard and a great non-drip water bottle. The best thing with this cage is that all the accessories are strategically placed to leave the inside so spacious which makes it easy to refill or clean, while also leaving enough room for your pet to move around. Again, setting it up is super easy, and you won’t need any tools. The instructions are clear. Lastly, the bars are not spaced too far apart, and this makes it a perfect cage for a hedgehog. This cage has been designed to provide maximum comfort for your pet. It includes a hay feeder (removable), a water bottle, an elevated feeding area which creates a space underneath for your pet to hide when it wants privacy or things get a little uncomfortable, and a stationary feeding bowl which prevents your pet from making a mess. 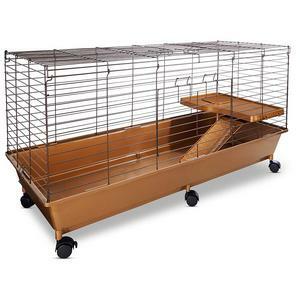 The cage is 39.5 inches long, 23.75 inches wide, and 19.75 inches high making it the perfect size for your pet. It has a full-width side door which lifts and rests overhead making it easy to clean, feed, and for your pet to play, and a top door for you to easily access it. It has a super easy to clean 5.5” deep plastic pan which collects your pet’s litter. The top is coated and has an inch mesh spacing to keep the cage well-ventilated while also giving the pet a clear view of its surrounding. 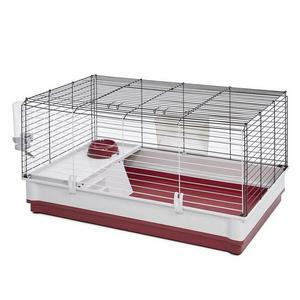 The cage can be expanded so you can have an extra litter, wood hutch, and a nesting area. It’s also pretty easy to set up and does not require any tools. It is also very sturdy, but you should not place heavy objects on the top. 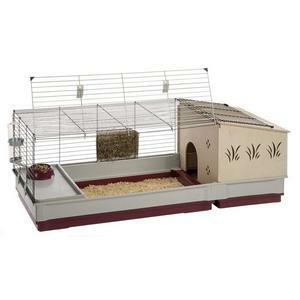 The cage, however, does not have a wheel for your pet to run yet hedgehogs run for a long time especially at night, so you might have to buy one separately, and luckily, it’s spacious enough to accommodate it. 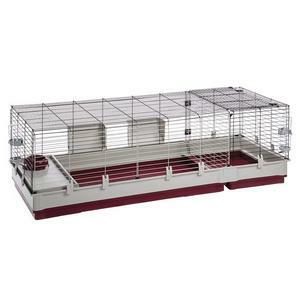 This is a spacious cage which is 32 ½ inches long, 19 inches wide and 17 ½ inches high. It has a large entry door at the top and another at the side for you to conveniently feed, clean, and access your pet, and an extra deep tubby base to provide enough room for your pet to live, move, and play comfortably, and also prevents it from spilling the bedding out of the cage. It also has tight⅜ inch wire spacing, and your pet will securely stay inside the cage without any possibility of escaping, and a clip at the door opening to prevent your pet from getting out when the door opens. The ramp and the platform are removable, and you can choose to take it out or leave it in the cage depending on how big the hedgehog is, and it also provides enough room for putting a wheel for your pet. It is very sturdy and easy to assemble. It does not include a wheel, and you will have to buy one separately. The cage has to be dismantled in order to be properly cleaned. You and your pet are going to love this cage. It comes with accessories including a water bottle, a hay feeder, a bowl, and a little house for your pet to live comfortably in. The wire-mesh is narrow enough for your hedgehog and it the wire is coated to prevent it from rusting, and your pet will not chew on it, thus increasing its durability. It has a small door at the top to allow quick maintenance operations. The front door is wide, and it opens completely for an easy inside the cage access, enabling you to reach the corners of the cage without straining. Also, it has plastic clips to prevent your pet from accidentally escaping. It has a large bottom to hold sawdust which collects dirt and food remains thus keeping the habitat clean. 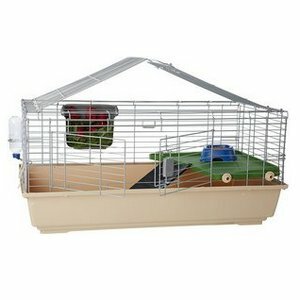 The base of the cage is sturdy and easy on your pet’s feet, and the thick plastic prevents your pet from chewing on it. It can be completely separated from the top making it even easier to clean. It has a partition with steps and a large shelf on the top which also acts as a second floor for your pet providing it with enough room to exercise and roam. The cage is sturdy and very easy to set up and take apart for cleaning. It is also very light making it easy to lift and carry around. It can accommodate up to two hedgehogs. This is a beautiful large habitat for your hedgehog. It includes a hay feeder, a drinking bottle, a feeding bowl, and a wooden covered shelter which will provide your pet with a sense of security and it can sleep inside and hide when things around it get too loud. The drinking bottle has a capacity of 600cc with a special hook for attaching it on the wire mesh, and it has a useful indicator for showing the water level. It has a wide front door which you can open for quick maintenance operations. The covered shelter is beautifully decorated, and its roof can be opened to allow you to clean inside the cage easily. The house can also be removed to remain with only the cage, and it has an extension which you can purchase separately as an accessory. The cage has a raised platform where you can place the feeding bowl, and the bottom is deep to hold bedding, litter, and messes made by your pet. The base is large and high and can also be separated from the top allowing you to clean it easily. The cage features a knock-out system where be easily disassembled and assembled. When it is not in use, the cage will take up very little space, and it also makes it very practical and convenient for you to travel with your pet. It is made from durable materials, and your pet can not chew the wire mesh. The cage can hold up to two hedgehogs. The cage has only the front door, and your pet can easily escape when you open it for maintenance operations. This cage is 63.78 inches long, 23.62 inches wide, and 19.69 inches high and is made with a wire top and a plastic bottom and has been designed in such a way that you can separate the base from the top. 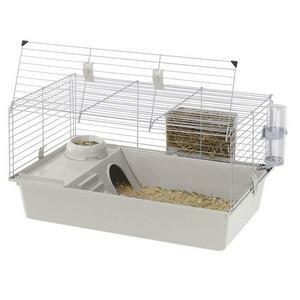 It includes a raised platform with a feeding bowl on the top, which also acts as a small house for your pet, a hay feeder, and a drinking bottle which has a capacity of 600cc and a special hook to fix it on the cage mesh firmly. The bottle also has anti-drop valves and a useful indicator of water levels, so you will know when it needs to be replaced. It has an extension which you can purchase separately which is separated from the main cage by a grill, and it can be unlocked with ease from the main cage. It features a knock out system and is very easy to assemble and disassemble within a short time. It takes a little amount of space when not in use which makes it convenient for travel. This feature also makes it easy for you to clean the cage. It is sturdy and durable, and its large size makes it possible for your pet to play around comfortably. You will need to purchase the wheel separately. It can fit more than one hedgehog, and you can keep your pet with its babies inside. It provides a comfortable living space for your pet. This cage is 40inches long, 17.5inches wide and 21inches high. The plastic base is brown in color with a wire top. It has front and top doors making it easy for you to have access to your pet and perform quick maintenance operations. It includes a ramp and second level platform. The base is broad and deep to conveniently hold sawdust or whatever else you decide to use as litter, and it provides enough space for your pet to eat and play. It has removable wheels at the bottom which makes it easy to move. The wheels can also be taken out to allow it to stay intact in one position. It is easy to assemble, and the wire top snaps onto the plastic base. You will need to put in a wheel since hedgehogs love to climb and run. Thus, it will keep it occupied while preventing it from trying to escape the cage. Hedgehogs are also quite clumsy, and you might have to take out the second floor to prevent it from falling and injuring itself. The cage does not come with accessories, and you will need to buy them separately. It, however, does not have a covered shelter and this is a critical item for every hedgehog cage since they prefer to sleep inside a covered shelter. You will, therefore, need to put one inside. The base has removable wheels making it easy to move the cage. This is an excellent habitat for your hedgehog. It is 42 inches long, 18 inches wide, and 19 inches high. It includes a hay feeder, a feeding bowl, and a water bottle. It is made from quality materials with a wire top and a plastic base. The wire is coated, and it is chew proof, and the plastic base is made from stain-resistant plastic and is easy to clean for your pet to live in a clean habitat. The base can also be removed and replaced easily. It is easy to assemble and does not require any tools since you are only needed to snap it together. The plastic base is deep to hold your pet’s litter and mess, and it has a fluorescent FerreTrail funnel for your pet to exercise by going through the pretend tunnel. It has three comfort shelves to provide your pet with more room, a solid safety ramp which allows your pet to access the shelves, and an extreme spiral slide for your pet to play. It has wheels to improve its mobility and a front door which can be opened for easy cleaning. It is sturdy and long lasting, but the bottom is open, and your pet will not get its privacy. It does not include a wheel for your pet to run, so you’ll need to purchase it separately. The cage needs to be taken apart for proper cleaning. This cage is 25 inches long, 12-½ wide and 12-1/2 inches high. It has a wire top and a metal pan. The wire is coated with powder, and it is durable and chew proof, and the spacing between the wires is a ½ inch. The metal pan also prevents it from getting chewed. It is easy to assemble and well ventilated for your pet to get adequate air. The top can be separated from the base making it easy to clean. The metal base also does not absorb smells making it a great habitat. It does not come with any accessories or a covered shelter, and you will need to purchase them separately. It has a front door for accessing your pet, feeding, or performing quick maintenance. It does not include any accessories for feeding your pet, and you need to buy them separately. 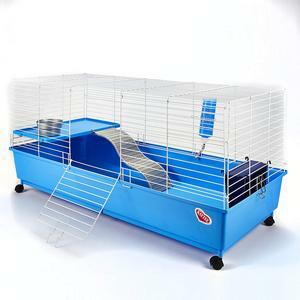 It also does not include a house, but the cage is big and the accessories, including the wheel, will fit inside. You can use it to transition your pet from one habitat to another. 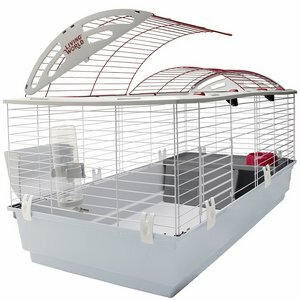 What kind of cage should I get for a hedgehog? Your hedgehog will need enough space to play and move about. A four square feet cage should be the minimum size. You should also ensure that the cage is roomy enough to accommodate a wheel since hedgehogs love them, a sleeping bag, a litter box, and the eating area (bowl and a water bottle). Apart from size, there are other factors to consider such as safety, ease of cleaning it, ease of setting it up, ventilation, etc. Do hedgehogs need a heat lamp? This entirely depends on the temperatures in your home or the hedgehog’s room. The ideal temperature for a hedgehog is around 72-80 degrees. So if this is not the case for you, consider getting a heat lamp and place it over the cage. And, to ensure that the temperatures are right for your pet all the time, always have a thermometer around his cage and monitor the changes. Both extremes, heat and cold, can really affect your hedgehog, and you can easily tell this from the change in their activeness. There are also other ways to keep your hedge warm during the cold season apart from getting a heat lamp. What bedding is best for hedgehogs? Hedgehogs love soft beddings, and they also like burrowing in them. Again, the beddings should be absorbent and shouldn’t be dusty. But, most importantly, the bedding should not get stuck in the hedgehog's spines, even when he/she isn’t completely dry maybe after taking a bath. If you decide to go with wood shaving bedding, ensure that it has no oils that could cause any health problems to a hedgehog or hurt their feet. Another bedding type to avoid for a hedgehog is cedar shavings because they will cause allergic and respiratory problems to your pet. The best bedding for hedgehogs is the fabric type such as pillowcases, fleece, and towels. They are not only affordable but also absorbent, washable and reusable. They also allow your little pet to burrow in them and will not hurt their delicate feet. Other hedgehog bedding types include corn cob bedding, paper shavings, Aspen shavings, etc. Can hedgehogs be housed together? Naturally, hedgehogs are not social animals. As such, you should be careful not to house them together unless you are sure that they won’t fight each other because they can badly hurt or even kill each other. If you need two hedgehogs and are not sure if they can share a cage, have two cages just in case they decide otherwise. Also remember, hedgehogs can seem to be okay with sharing a cage for a few days or even weeks then one day they decide, or one decides otherwise. To prevent any dangers, always keep an eye on your hedgehogs and be ready with an extra cage for such moments. Also, remember to put two of everything in a shared cage to avoid conflicts and go for a spacious cage. However, some hedgehogs respond very well to a new friend to the point of even becoming more active. But, always make sure that you are not housing males and females in the same cage unless they are neutered and spayed. Unlike some pet animals, hedgehogs do not often need baths because they are generally clean. However, sometimes they will need that bath, and luckily it’s super easy to bathe them. You will at least need some warm water, shampoo, a toothbrush, and a towel. You can also take this time to trim his/her nails while also checking if you have cleaned the feet and quills thoroughly. Hedgehogs are tiny and cute, and as pets, they are easy to care for. The first thing you will need before bringing one home is a good and fully equipped cage, and lucky for you we have reviewed the ten best hedgehog cages to help you make an informed decision. Make sure the cage you choose is fully equipped before bringing your little friend home to ensure that he/she will have a comfortable life. Good Luck!